A Mommy's Adventures: We Love Our Library! I grew up in the town that we now live in and have such fond memories of our library. It has looked pretty much the same since I can remember, but it is so special to see Emily and now Juliette enjoying the same things that my sister and brothers and I enjoyed so many years ago and hope that they will both love the library as much as I still do today! The girls love playing with the bead maze table. I love that I can look at the books in this area while they play. It is sectioned off with bookcases so the children have a special place to play. The chairs are also a lot of fun. The kids always have fun playing with them. They have on many occasions been lined up and turned into a make believe train! There are also lots of fun puzzles and games to choose from. Emily loves picking out the large floor puzzles to do here. This picture should probably be first, since this sitting area is actually at the entrance to the children’s section, but we always visit it as we are leaving. It is shaped like a carousel and there are lots of cushioned seats to sit on and read. It was my favorite part of the library when I was little and I love that Emily gets to sit on it and read just like I did!! 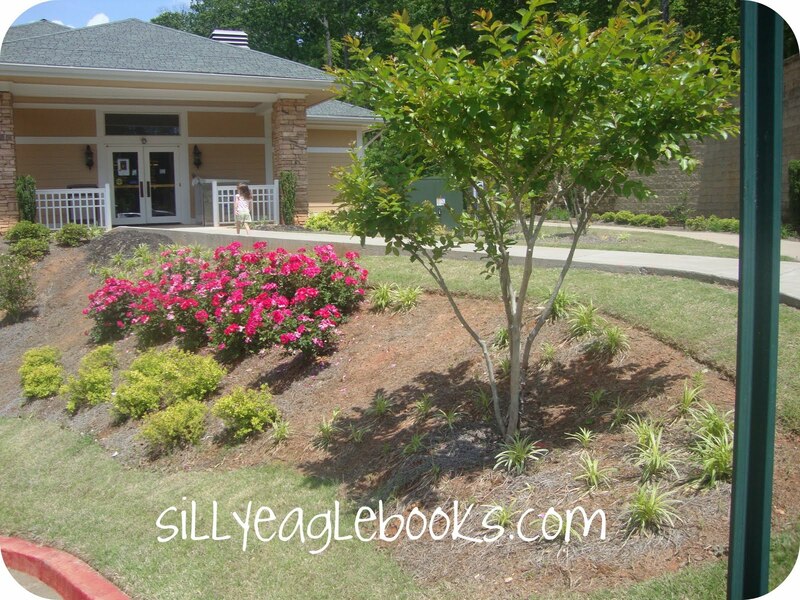 Thank you to Christianne @ Little Page Turners for hosting this fun link up. 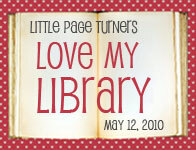 Be sure to click on the link to check out all of our friends libraries too! Congrats! You won my giveaway of the GameWright game! Please email your address so that they can ship it to you. How neat to be able to share memories with your girls. And, what a nice space for story time! It must be fun to show your kids things you remember as a child. I love how child friendly the library is. It's special to be able to recall your childhood memories as you watch your children enjoying some of the exact same things you did as a child. What a fun place to spend time. Wow- what a nice library! Looks like such a fun area for kids to learn and play! Thanks so much for linking up!!! wow - you have a REALLY nice library! What a lovely trip to the library! I will have to go with Red Ted soon! Remember my first trip: was in the summer holidays visiting relatives in Canada... was enthralled by the story telling and art activities!